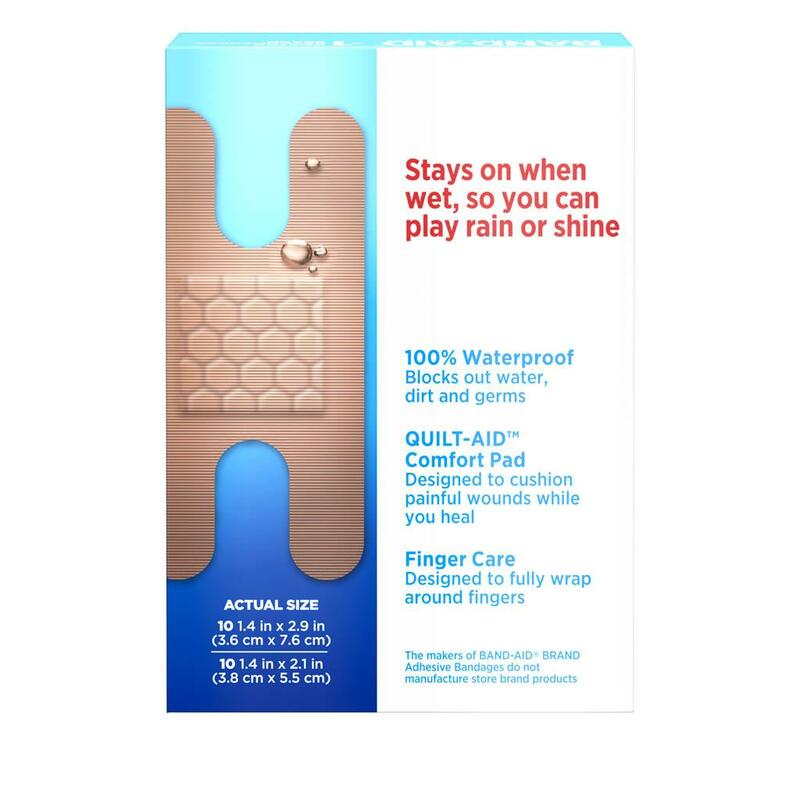 100% Waterproof BAND-AID® Brand WATER BLOCK® Knuckle & Finger Bandages stay on even when wet and feature a four-sided seal adhesive that keeps pad dry while blocking out water, dirt and germs. The QUILT-AID™ Comfort Pad is designed to cushion painful wounds while you heal. 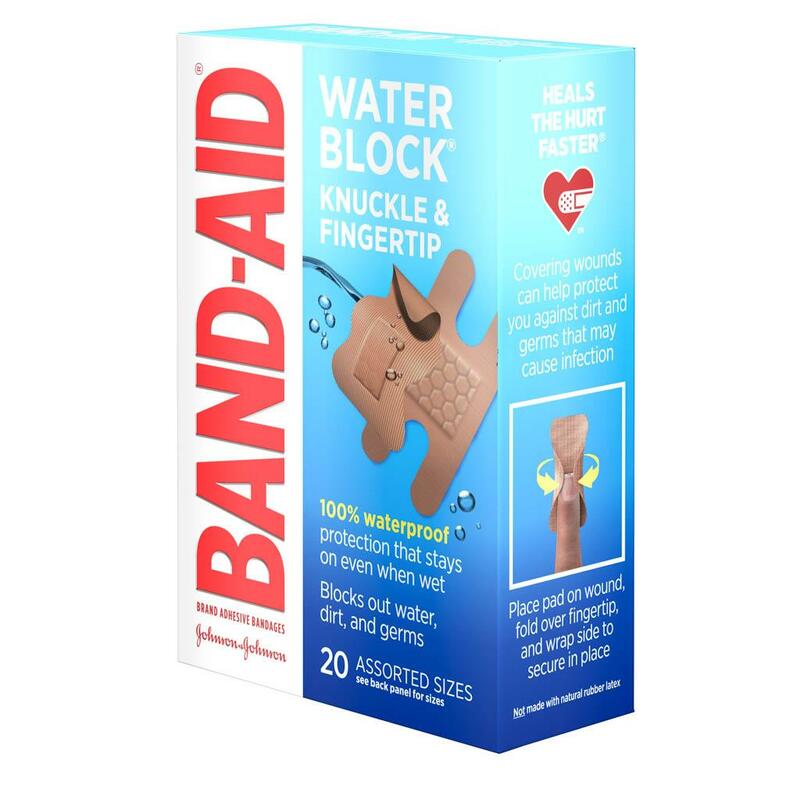 BAND-AID® Brand WATER BLOCK® Bandages have a non-stick pad, allowing for gentle removal. 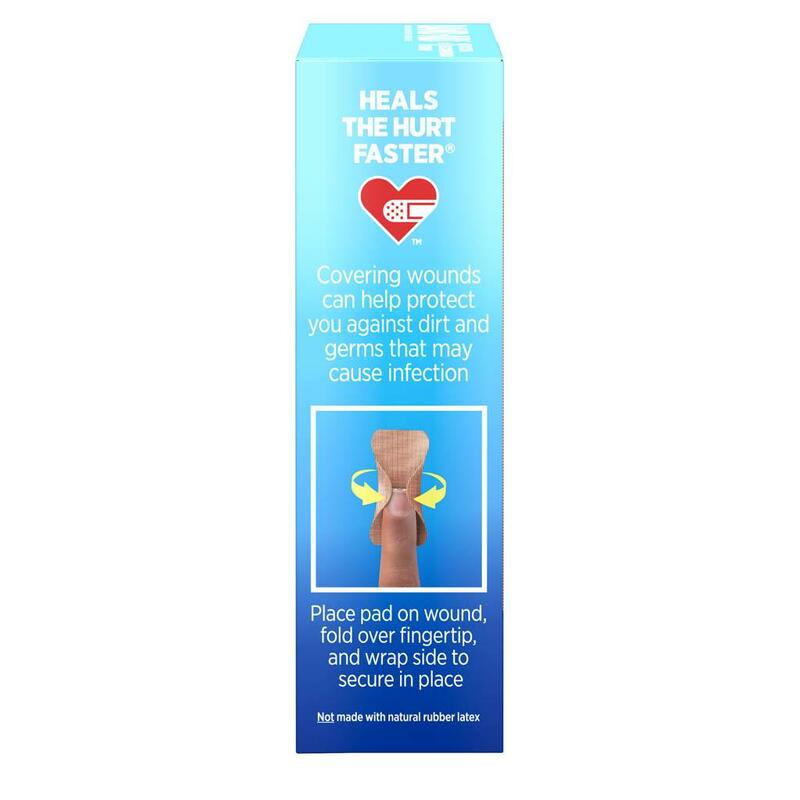 This package contains 20 sterile bandages, in assorted sizes. Took my skin off !! Even with the gentlest of removal techniques - the adhesive ripped off a large-ish piece of my skin. Now I have an almost 1 inch square would that looks like a burn and hurts just as much. Never experienced this before with any bandage - Band Aid or otherwise. We wouldn't expect it to harm your skin and we would love to learn more about what happened. Give us a call at 1-866-565-2873 Mon-Fri, 9am-530pm ET. Hope to hear from you soon! 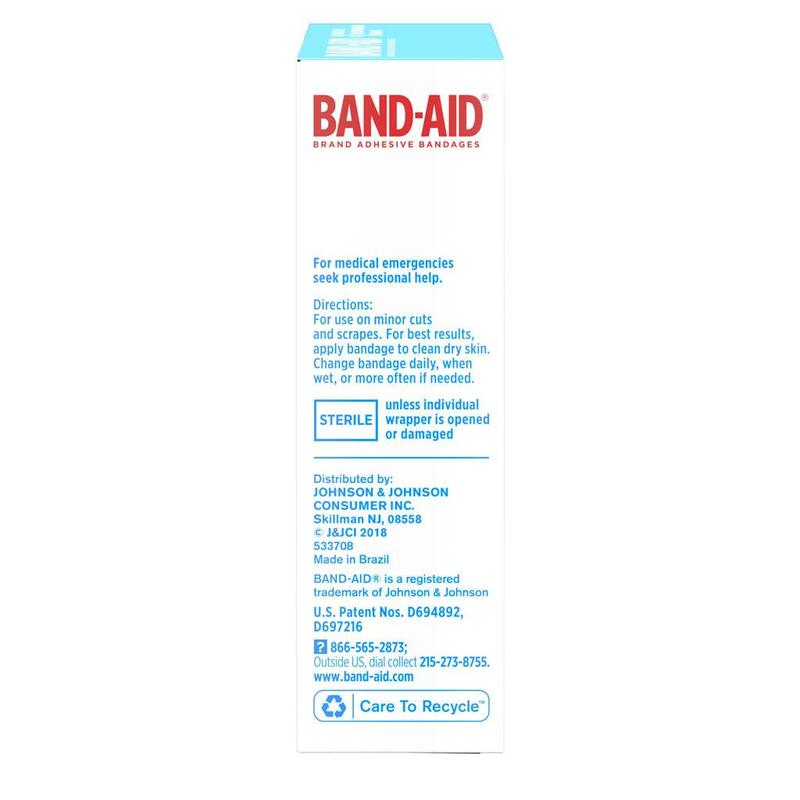 After a small skin cancer removal I used one of these BandAids. Removing it the next day (under running water) pulled off a layer of skin from the entire adhesive area. I have never had an issue like this removing any other bandage! Now I have a serious wound to deal with for weeks. We're very sorry to hear about this! We would like to learn more about your experience using our bandages. Please give us a call at 1-866-565-2873 M-F between the hours of 9A-5:30P ET. Thank you and have a good day! Tough Strips leave a residue of adhesive especially on fingernails which is hard to remove. Woven fabric was prone to fraying. I had a bad laceration on my thumb and would wrap the bandage completely around and over it but the bandage didn't stick to itself for very long. I found the Flexible Fabric Band-Aids to actually worked much better. We want to learn more about your experience. Please give us a call at 1-866-565-2873. We're available Monday-Friday 9AM-5:30PM ET. When you call mention your username to our team. We hope to speak with you soon. Used this bandage for the first time. They do not open from the individual package easily. When I took off the bandage the adhesive wanted to pull the skin. After the bandage was removed, there was the sticky adhesive on my skin. Alcohol and soap and water were used, but did not remove the stick adhesive from my skin. Do not use this product. We're so glad you let us know! We'd love to learn more about your experience. Give us a call at 1-866-565-2873, we're here from 9AM to 5:30PM ET Monday through Friday. Hope to hear from you soon! I used this product for a blister. After only 12 hours, I removed the band-aid and it ripped my skin, causing a new open bleeding wound from the band-aid adhesive. My blister is healing, but now I have a new wound that is far worse than the blister ever was. I will never buy or use this product again. It is unsafe! Thank you for bringing this to our attention, we would never expect this from our bandages! We're terribly sorry this happened to you and we would like to learn a little more. Please give us a call at 1-866-565-2873 M-F between the hours of 9A-5:30P ET. We're looking forward to speaking with you! My skin tore off when removing this type of bandaid. After removing the bandaid that had been on for approximately 14 hours it tore my skin off at each end where it's sticky. The sites where the sticky portion was oozed for two to three days. Anything that touched it made it raw and sore. It felt like a bad burn. My husband thought maybe I had a reaction to either latex or the glue. After reading reviews I'd say it's the product. Today is day six after the removal of the bandaid, it is barely scabbing over, still sore and red around the sites. I definitely would not use these on children or soft skin and soak off if ever used. We're sorry to hear about this experience you've had with our product and we'd like to see how we can help. Please give us a call at 1-866-565-2873, Monday - Friday from 9 AM to 5:30 PM ET. We hope to talk soon! These used to last forever. Now I barely get a day out of one bandaid before it frays apart. Have gone through two boxes of the new style. I don’t seem to have an issue with them sticking too much , but the ends lifting up. The rest of the bandaid stays attached. Thanks for your feedback! We're sorry to hear that these didn't work out and we'd like to learn more. Please give us a call at 866-565-2873, M-F 9am to 5:30pm ET. We hope to speak with you soon!